Webster University was named a “School of Distinction” by Bestcolleges.com for its online learning and degree programs. The “School of Distinction” title is awarded to colleges with online programs that are consistently ranked among the best in the country. Webster earned a “silver ranking,” putting it in the top 41 universities in the United States. The full rankings can be found online at www.bestcolleges.com/features/schools-of-distinction/. Webster University is ranked #2 of Best Online Colleges in Missouri by Community for Accredited Online Schools. Webster was ranked 17th among all private institutions in the United States, and 84th among all institutions on the annual list. Webster is one of only two universities in Missouri ranked this year. More than 500 institutions were reviewed, but only 137 institutions were selected for the list. Webster has one of the highest six-year graduation rates for veterans in the country. 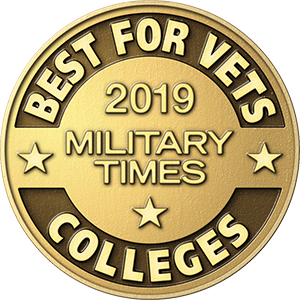 Overall, Webster was ranked 27th among all four-year institutions in the United States for graduation rates among vets, and 10th among all private institutions.